Formed out of the ashes of Scottish punk band Skids by their guitarist Stuart Adamson, Big Country became one of the biggest British alternative rock bands of the 1980s, with a huge reputation as a live band to rival the likes of U2 and Simple Minds. 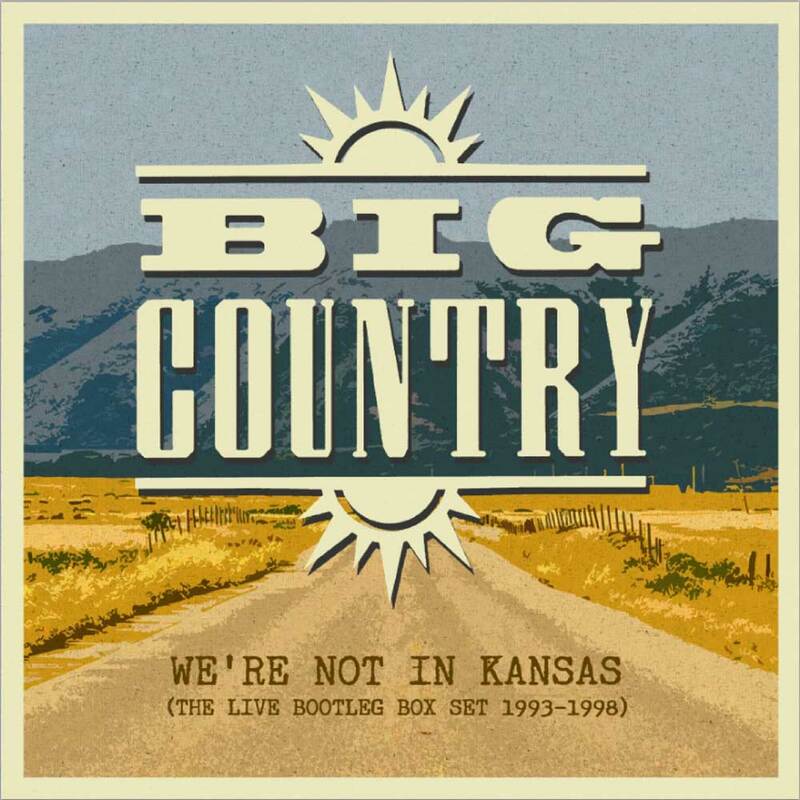 “We’re Not In Kansas” pays tribute to the tour de force that was Big Country were in the Nineties, with recordings of five live shows released officially for the very first time and with the full blessing of the band. The new box set We’re Not In Kansas (The Live Bootleg Box Set 1993-1998) (Cherry Red CRCDBOX43) seeks to fix this, offering fans a handsome, band-approved chronicle of a worthy era. The story of Big Country up to the time covered in We’re Not In Kansas goes like this: the quartet, featuring ex-Skids guitarist Stuart Adamson on vocals and guitar, guitarist Bruce Watson, bassist Tony Butler and drummer Mark Brzezicki, hit the U.K. Top 10 with singles like “Fields of Fire,” “Chance,” “Wonderland” and “Look Away” during the early-to-mid-’80s; the hopeful, ringing guitars of “In a Big Country” gave the band a taste of American success, too. But by the late ’80s, consistent hits were harder to come by, with the Peter Wolf-produced Peace In Our Time (1988) a particular misstep, overly reliant on middle-of-the-road pop production. Brzezicki left the group at decade’s end, but served in a session capacity on the fraught 1991 follow-up, No Place Like Home, which turned out to be the band’s last major-label effort. 1993’s The Buffalo Skinners saw the trio go back to basics – effective, guitar-driven melodies coupled with fiery lyrics in praise of the hopes and dreams of the working class – and the ensuing tour found the classic lineup whole once more. The full band continued for two more albums and a final tour in 2000, one year before Adamson took his own life after a prolonged battle with alcohol abuse and depression. Included on this 5CD set are selections from six different shows: a gig at Minneapolis’ First Avenue in 1993, right after the release of The Buffalo Skinners; an acoustic theatre show at the University of Stirling in the band’s native Scotland from 1994; two shows from the summer of 1995 (an electric performance at Glasgow’s Tower Records store and an acoustic one in Rotterdam) in support of that season’s seventh album Why The Long Face; a portion of a 1998 acoustic set in the group’s hometown of Dunfermline, Fife, Scotland (recorded at Tappie Toories, a pub run by Adamson and his second wife); and a final cover of The Monkees’ “Daydream Believer” from a 1995 set. For a band so known for electric guitar tones, the presence of so much acoustic material here is a particular treat. (As John Gouveia writes in his liner notes, the band’s first acoustic appearance at an American show in 1993 was in fact out of necessity, after the venue’s power failed before the group took the stage.) The songs retain their power even without their distinctive solos, and at a time when “unplugged” shows were in fashion, it ceretainly fits the mood of the day. Indeed, “In a Big Country,” “Chance” and “Look Away” don’t lose much power when de-amplified, nor do newer tracks like “We’re Not In Kansas,” “All Go Together” and “Ships.” And both acoustic and electric sets from the same tour have enough unique songs among them: the First Avenue set includes powerful renditions of Buffalo Skinners cuts “What Are You Working For” and “Pink Marshmallow Moon,” while the Stirling set features a gorgeous, quiet take on Steeltown (1984) closer “Just a Shadow” and a slowed-down “One Great Thing,” one of the fine singles from The Seer. The electric set at Tower Records in Glasgow is more devoted to then-new selections from Why The Long Face, like “You Dreamer,” “I’m Not Ashamed” and “Send You.” Meanwhile, the acoustic Rotterdam show (punctuated by some interesting interactions between Adamson and the audience during the set) features some of those same tracks alongside the hits you’d come to expect. If there’s one caveat to the material on We’re Not In Kansas, it’s that is very much an official bootleg. These aren’t soundboard-quality recordings by any means, and even the better of the audience recordings tend to flutter quite a bit in the headphones. For some, that may drop it down from “must hear” to “fans only” status – which is a shame, as it’s not only good material, but packaged far better than any unofficial release. Cherry Red put each disc in its own cardboard wallet, accompanied by a fine booklet with band photos and a new interview with Butler and Watson – all in a compact clamshell box. We’re Not In Kansas may not appeal outside of Big Country’s fan base, but if you’re part of that base, you should absolutely check it out. Adamson’s tragic passing means we only have Big Country’s music and memories to commemorate him as a frontman – and, speaking wholly from personal experience, his music has uplifted me long and far enough to consider any opportunities to hear him on record. The output of Big Country, as heard on We’re Not In Kansas, feels like home to those who feel that familiar lift whenever those guitars ring out. And you know what they say: there’s no place like home. Across these various in-concert recordings, which have previously been available only on elusive, under-the-counter bootlegs, you’ll hear a band touring to promote their most recent albums The Buffalo Skinners (1993) and Why The Long Face (1995), with live sets which often climaxed with impassioned cover versions of ‘Don’t Fear The Reaper’ (Blue Oyster Cult), ‘My, My, Hey Hey’ and ‘Rockin’ In The Free World’ (both Neil Young) and ‘Tracks Of My Tears’ (Smokey Robinson & The Miracles). Founder members Bruce Watson and Tony Butler have been interviewed for the Q&A sleeve-notes, which document a fascinating and largely undocumented period in the band’s history. Also included, as one would expect, are rousing versions of many of their evergreen hits – ‘In A Big Country’, ‘Look Away’, ‘Chance’, ‘Wonderland’, ‘Peace In Our Time’ and ‘King Of Emotion’.